Education for everybody could be the key to ending world poverty. Good progress has already been made, but much more is needed to get every child to school before 2030. When the nations of the world agreed on the 17 Global Goals, they made a plan so ambitious that it can seem overwhelming. How will we ever be able to achieve all those big, important, and interconnected goals, and where to even start? But the answer may actually be quite simple: Start with school. “Of all of the investments needed to achieve sustainable development, none is more important than Goal 4: Quality Education,” Mr Sachs told World’s Best News. The goal aims to achieve universal primary and secondary education everywhere by 2030. “If we can guarantee that every child in the world will be able to start in kindergarten and then go at least all the way through a quality secondary education, that would mean a breakthrough,” says Mr Sachs. “It would enable the end of poverty and empower people to achieve good health and decent work, and to be good active participants in democracy”. The first thing that many people think of when they consider the benefits of education is probably that it makes people more successful with money; reducing poverty and boosting economic growth. This is true. In fact, each extra year of schooling that a girl or boy receives will increase his or her later income by 10 percent on average, according to a report by UNESCO. The organisation estimates that if all students in low-income countries left school with basic reading skills, that would help 171 million people escape poverty. This alone would mean a 12 percent cut in global poverty rates. But it’s not just about money. Education also has a wide range of other benefits to the individual and to society in general. For example, education improves public health, because better educated mothers are generally better at taking care of their children, vaccinating them and giving them better quality food, allowing the children to grow up healthy and develop well. In Indonesia, child vaccination rates are 19 percent when mothers have no education, but this rises to 68 percent when the mother has at least a secondary school education. In the same way, education reduces maternal deaths, because educated mothers are more likely to space out pregnancies and to seek health care and support. Education also helps fight diseases such as HIV and AIDS. Women with post-primary education are five times more likely than illiterate women to have useful knowledge about the disease. When people become more educated, they get better at protecting not only themselves, but also at avoiding passing the disease on to others. In Malawi, a survey found that only 27 percent of mothers without education knew that it’s possible to prevent passing on the virus to an unborn child by taking antiretroviral drugs. In the group of women who have a secondary education, more than twice as many knew this life-saving fact. At the same time, education can promote gender equality, reduce child marriage, and even promote peace, according to the United Nations, because education makes people understand that the challenges of all people in the world are interconnected. In short, education is one of the most important investments a country can make in its people and its future. It costs on average $1.18 a day per child in developing countries to provide a full cycle of pre-primary through secondary education (13 years). The total annual cost of this is estimated to be 340 billion dollars, and the largest share of this cost, 88%, is to be paid by the developing countries themselves. That leaves a funding gap of just 14 cents a day per child, which the international society should help cover, according to Jeffrey Sachs. “I find it a huge mistake for any rich country not to be doing more. If we want a safe world, if we want a secure world, if we want a prosperous world, investing in education is so obviously a priority,” he says. All in all, the world has made big progress towards education for everyone. The number of children and adolescents out of school has been nearly halved since 2000. Today, more than nine out of every 10 children are in school, and there are finally just as many boys as girls in the classrooms – on average. In 1990, 76 percent of the world’s population could read and write. Today, it’s around 85 percent, according to latest data from 2010. But saying that the problem has been halved also means we still have half the work left to reach the point where every child gets an education. Progress has slowed since 2005, and 59 million children and 65 million adolescents are still out of school. Most of them are girls. Educated girls and women tend to be healthier, have fewer children, earn more income and provide better health care for themselves and their future children. 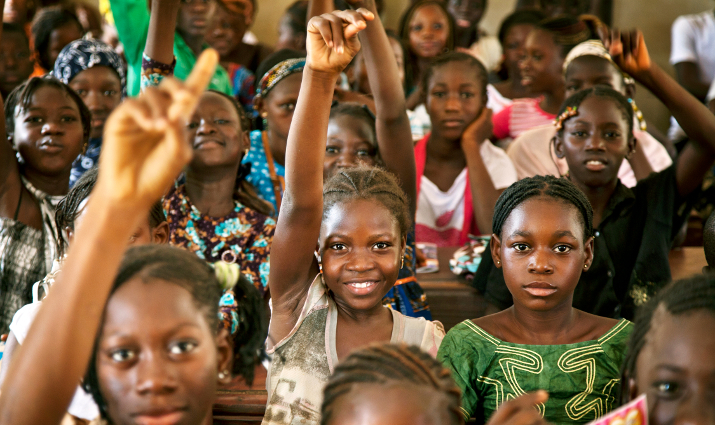 These benefits also are transmitted from generation to generation and spreading across communities, so focusing on girls’ education is an especially good investment for any country. But getting all girls to school is not always as simple as building schools, buying pencils, and hiring teachers. Poor families may need girls to work at home, and many girls lose days of class during their periods, or stay home because schools have no proper toilets. Free school meals, decent separate toilets for boys and girls, and access to sanitary pads have all been shown to get more children and teenagers to school. Despite the good results from these special solutions, there is one big obstacle to reaching the goal of education for everyone: war. More than a third of the last children out of school live in conflict areas, where society and normal way of life break down and children are often forced to flee with their families. There are now 65 million forcibly displaced people in the world, and despite efforts by the United Nations and others, only half of the refugee children are enrolled in school. These children risk becoming a ‘lost generation’, because just as there’s huge benefits to having education, losing out on school is a severe handicap in any modern society. While education is needed for a peaceful world, more peace and stability will be needed to reach the goal of educating all children before 2030.